Mahayana Films Ltd. - 110 min. 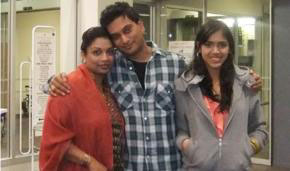 Sid is an Indian immigrant who has recently arrived in New Zealand. Instead of focusing on his studies to become an engineer, he goes behind his parents back and gets a part-time restaurant job to buy a motor bike and catch the attention of girls. However things begin to change when the first ever 'Auckland Metro Cooking Competition' presents an opportunity to change his life. The struggle to keep all sides happy leads Sid to question who and what is most important in his new life. A comedy mixed with some serious issues that made me laugh more than once. Very good dialogue soundtrack, although I found most of the music to be less appealing. Locations around Auckland, except for the first 6 minutes that was shot in India. Photography was also a bit off the mark in technical quality (a tad too magenta and a bit soft), but satisfactory. Recommended. The PAL R4 dvd's format is 1.78:1, enhanced for 16:9, with a 5.1 dolby digital English soundtrack that contains subtitles when Hindi is spoken. Extras include a 9 minute "Behind the Scenes" featurette, a 6 minute music video and the trailer. It is available from New Zealand resellers for about $25nz. Commencing 20 August, 2012, it became available on R2 dvd, from UK resellers for about 8#, under the title of 'Vindaloo Empire'. The format measures 2.00:1, but is enhanced for 16:9 and has a 2.0 English soundtrack that, like the R4 one, contains subtitles only when Hindi is spoken. The R2 version has no extras. WorldCat is the world's largest library catalog - Click to find the nearest Library that has this title.